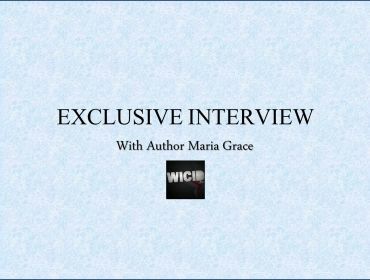 In my first interview for Wicid.tv, I was privileged to speak to author, Maria Grace. It was very interesting to find out about Maria’s personal life and her career! 1. So, you are a valleys girl born and bred. What was the town of Caerphilly like when you were growing up? Caerphilly was a nice town, but to honest, I feel much more at home in Pontypridd. 2. Now, you live in Pontypridd. I was intrigued to read on your blog that you enjoy looking at old photographs of Pontypridd. What are your thoughts on your town? I love my community. I do really enjoy looking at old photographs of Pontypridd, because it looked like such a beautiful place, back in the day. I understand that places have to evolve with the times, but there’s something magical about the simplicity and organic beauty of the old town. I wish it could be restored to its former glory. Ynysangharad Park has been improved a lot. The big playground has been renewed for the kids, and the Lido is being opened again this summer, following a massive restoration project. I’d love to see this kindness continued for the area in future, and I’d love to see the spirit of our traditional places kept alive, because I think it’s very important for the morale of the town. 3. Would you like to see more businesses to come into the town? Yes, definitely. But I don’t just want to see more business, I want to see better business! We are seriously lacking in recreational places and fun activities for children and young people; and we could also really do with some good, healthy restaurants, takeaways and general foodie places here. While we’re at it, I need a proper bookstore! I would love, love, love to own my own bookstore – with a cafe, and a writing lounge, and a workshop space… Sorry; I’ll shut up now! You get my point! 4. Moving on, let’s talk about your school life, when did you first fall in love with writing? I basically fell out of the womb with a pen in my hand! I can’t remember a time in my life when I wasn’t writing about something. When I was little, I would always be writing songs, poems and stories. As I got older, I also kept journals and considered myself to be the Penpal Queen! I instinctively knew from a very young age that I wanted to be a writer. 5. Did you always want to become an author? Yes; for as long as I can remember. 6. I’d love to know about your debut novel White Petals. It sounds really interesting; so what is it all about? White Petals is a YA Fiction novel, set in Wales. It’s a heartwarming comedy about a 14-year-old clairaudient who has been taken into care because her mother has had a nervous breakdown. Narrated by the protagonist, Emmeline, the story follows the teenager as she learns to deal with her new-found psychic ability at the same time as trying to adjust to life in a children’s home. And if that’s not enough on her plate, she also has a mother in hospital and a school bully to deal with! 7. I understand that you studied Creative and Professional Writing at The University of South Wales. What was university life like for you, Maria? University was great for me. I learned so much during my studies, and I made some wonderful friends. Also, I met two of the greatest tutors I’ve ever had the pleasure of being taught by – Rob Middlehurst and Philip Gross. Those two men taught me so well, and they really helped me with my creative development. I studied Creative & Professional Writing and I also studied TESOL (Teaching English as a Second or Other Language). I graduated from my degree with a First, and upon graduation, I was awarded the Stella Levi Prize for Academic Excellence. After my degree, I took some time to finish writing my novel and study for my PGCE. I loved studying for my degree – it was really difficult and stressful at times, but I wouldn’t swap my time at uni for anything! 8. What advice would you give to young people like me in Wales that want to go into journalism or writing? In all honesty, it’s not an easy industry in many ways, but completely worth it when you find your creative outlet! Writing itself comes very naturally to me – it’s like a constant fire in my belly that never goes out, but needs a little extra coal and a poke now and again to keep the spark going! The hard work comes when you have to commit to a project and make a promise to yourself and your work that you will see it through to completion, and no matter what happens, you won’t give up on yourself. It might take you ten months, it might take you ten years. You may need to work every day, you may need to find some time for yourself to write whenever you can squeeze it in, but really all it takes is something to write on (computer, writing pad and pen), somewhere to write, and something to write about. Find your voice. Find your story. Find your outlet. Find your audience. Find your trust. Find your courage. I would say to find yourself, but as you write, that will happen naturally. 9. Do you plan on writing any more novels in the future? Of course! I’m just finishing my first children’s book for 7-10 year olds and I have a little spark going off in the background for a second YA novel with a gorgeous protagonist. I don’t want to say too much, in case my lovely Emmeline gets jealous! 10. I’d like to ask you about social issues regarding reading and writing now. Over recent years, teenagers have lost interest in picking up a book and reading it, probably due to technology. In your eyes, have teenagers given up on reading? Oooo! That’s a good question! I would be lying if I said that I wasn’t disappointed by the decrease in reading books. It’s not something we can deny or ignore. As a child, I read a lot of books. I escaped through them and I learned through them. But times have moved on, and like it or not, things have changed a lot since then. I don’t think technology is a bad thing at all – I think we’re very blessed to have such instant access to worldwide knowledge, whenever we want it. And I think teenagers still read; they just read in different ways now. I would like to see more of them reading actual books, though. 11. And finally, due to council budget cuts, as a result many local libraries are closing to save the council money. What is your view on this? It makes me sad. I hate it when any place of learning or sanctuary is closed down. I don’t understand it. They complain about children and young people not learning enough today, and in the same breath, they take away their freedom of choice with limited GCSE modules, they close down libraries and places of historical interest, they cut back on youth clubs and youth workers, they underpay teachers, and they don’t put nearly enough funding into creative incentives. Combine that with the ridiculous standardised exam testing, and we have a broken system run by Pimms-drinking fat cats who think they know best and dictate the choices of children and young people, without really checking with them what it is the children and young people actually want. We need these places to stay open. They’re important outlets for our communities! And we also need a new way of communicating our needs to each other, working together as equals, and putting healthy steps in place to create an inclusive system where it’s not us against them, it’s us with them. We can’t evolve properly with this divide; we need to meet in the middle and work together if we want to improve our way of life as a whole. 12. Maria, it has been a pleasure interviewing you, on behalf of myself and WICID I’d like to wish you all the best and thank you very much for talking to me! You’re very welcome. The pleasure was all mine. Sorry for all the ranting – I get a bit carried away with myself sometimes! Maria Grace’s novel, White Petals, was published by Firefly Press in June 2015. You can buy it here.